Daryl Johnson (Worcester Park, United Kingdom) on 13 February 2009 in Documentary & Street and Portfolio. 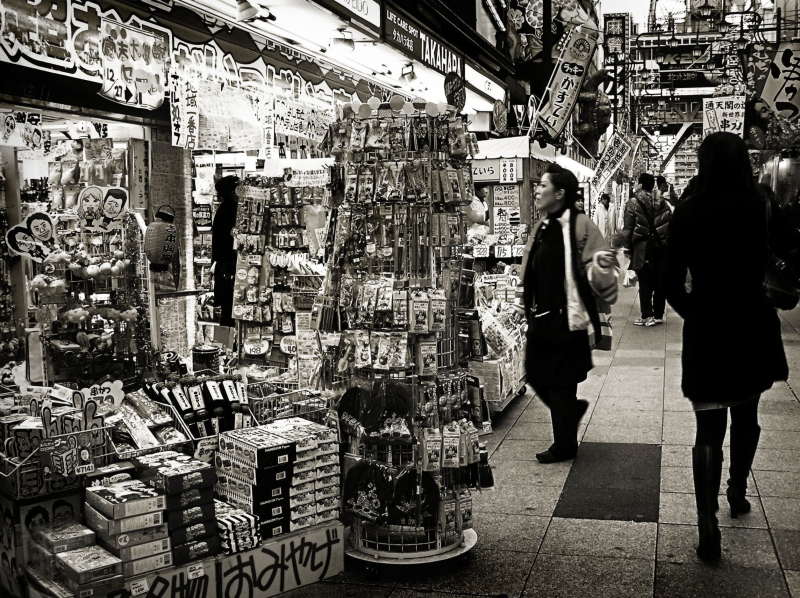 Souvenir shops and restaurants line the streets in the Shinsekai ('New World') district of Osaka. Developed in the early 1900s as an exposition site, the area has had quite the history, although it has a somewhat shady reputation these days. Still, today, its kushi katsu restaurants are a big tourist draw, and the Tsutenkaku tower (photo coming up soon) is a famous symbol of Osaka. Lot's of souvenirs to sell. Nice shot. Like how, in b&w, the souvenirs become an indistinct complicated mass. nice street shot ! so many details ! @Lorraine: Cheers Lorraine! Don't worry, these shops don't sell anything expensive! I think this is a terrific lifestyle, urban streetscape. You've captured such excellent detail in this. @Diane Schuller: Thank you Diane! There's a lot to look at in this great shot. Nice one. This type of streets are in many towns in Japan. I don't like them, BUT.....they always draw my attention with the strangest collection of knick-knacks and all sorts of so-called souvenirs. ALWAYS a lot to look at and you captured so well the details! Another special capture!!!!! @Japanalia: Thanks Gabriela. Yes, not 'attractive' areas in the traditional sense, but there's lots to draw the eye in this sort of place.